Of the five known dwarf planets in the solar system, only two have been observed in detail (Ceres and Pluto). But now, the European Southern Observatory (ESO), using three telescopes have observed the dwarf planet Makemake and discovered that this dwarf planet may not have any atmosphere at all. In 2006 at the General Assembly in Prague of the International Astronomical Union (IAU), the IAU introduced a new type of planet; the Dwarf Planet. By their definition, a dwarf planet is "A celestial body that (a) is in orbit around the Sun, (b) has sufficient mass for its self-gravity to overcome rigid body forces so that it assumes a hydrostatic equilibrium (nearly round) shape, and (c) has cleared the neighbourhood around its orbit...". Famous and most controversial of the newly classified dwarf planet is Pluto. From being a "normal" planet, many believed it was unjustly demoted to the status of dwarf planet. There are five known dwarf planets orbiting the Sun. These are Ceres, Pluto, Haumea, Makemake, and Eris. For the first time, astronomers have observed the dwarf planet, Makemake and discovered that unlike Pluto, it has no atmosphere. Astronomers have used three telescopes at ESO’s observatories in Chile to observe the dwarf planet Makemake as it drifted in front of a distant star and blocked its light. The new observations have allowed them to check for the first time whether Makemake is surrounded by an atmosphere. This chilly world has an orbit lying in the outer Solar System and was expected to have an atmosphere like Pluto, but this is now shown not to be the case. The scientists also measured Makemake’s density for the first time. The new results are to be published in the 22 November issue of the journal Nature. Dwarf planet Makemake  is about two thirds of the size of Pluto, and travels around the Sun in a distant path that lies beyond that of Pluto but closer to the Sun than Eris, the most massive known dwarf planet in the Solar System. 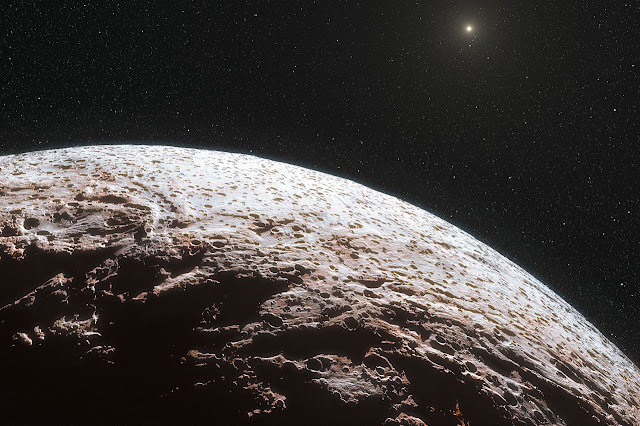 Previous observations of chilly Makemake have shown it to be similar to its fellow dwarf planets, leading some astronomers to expect its atmosphere, if present, to be similar to that of Pluto. However, the new study now shows that, like Eris, Makemake is not surrounded by a significant atmosphere. The team, led by José Luis Ortiz (Instituto de Astrofísica de Andalucía, CSIC, Spain), combined multiple observations using three telescopes at ESO’s La Silla and Paranal observing sites in Chile — the Very Large Telescope (VLT), New Technology Telescope (NTT), and TRAPPIST (TRAnsiting Planets and PlanetesImals Small Telescope) — with data from other small telescopes in South America , to look at Makemake as it passed in front of a distant star . The ESO released an announcement, Dwarf Planet Makemake Lacks Atmosphere, regarding this discovery in tandem with the Nature report, No Global Pluto-like Atmosphere On Dwarf Planet Makemake From a Stellar Occultation. Both reports can be accessed in the Related Links Below. Makemake was initially known as 2005 FY9. It was discovered a few days after Easter in March 2005, earning it the informal nickname of Easterbunny. In July 2008 it was given the official name of Makemake. Makemake is the creator of humanity and god of fertility in the myths of the native people of Easter Island. Another of the telescopes used in this observing campaign was an 0.84-metre telescope installed by the Católica del Norte University of Chile. This telescope is sited on Cerro Armazones, the future site of the European Extremely Large Telescope (E-ELT). Makemake passed in front of faint star NOMAD 1181-0235723 (where NOMAD refers to the Naval Observatory Merged Astrometric Dataset) on 23 April 2011. The team observed this event using seven different telescopes across Brazil and Chile. The event only lasted about one minute, so the astronomers took advantage of a specialised high-speed camera known as ULTRACAM (eso0520) and a high-speed infrared imager named ISAAC to capture the event.